Gouvernemens Generaux du Berry, du Nivernois, et du Bourbonois. 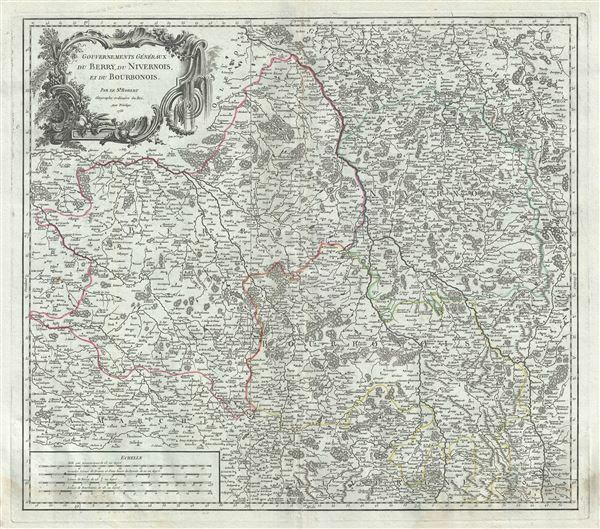 This is a fine 1753 map of the Nivernais, Berry and Bourbonnais Regions of France by Robert de Vaugondy. It depicts the region from Sully south to Sermur and from Loches east as far as Roanne and covers the whole or parts of the departments of Indre, Nievre, Yonne, Allier and Cher. The map renders the entire region in extraordinary detail offering both topographical and political information with forests and mountains beautifully rendered in profile. The important cities of Bourges, Nevers, Moulins, Chateauroux, Montlucon, etc. are identified. Part of the prestigious Burgundy or Bourgogne wine region, the Nievre region is known for its production of Pouilly Fume, a white wine. The word 'fume' is French for 'smoke,' and it is said the name comes from the smoky quality of these wines. Yonne is one of France's premier Burgundy wine regions and produces some of the world's finest reds. Yonne is also one of only two departments that produce Chaource cheese. Chaource is a cow's milk cheese, cylindrical in shape. The central pate is soft, creamy in color, and slightly crumbly, and is surrounded by a white penicillium candidum rind. Allier is known for its production of Saint-Pourcain wine. It is also one of the rare places in Southern Europe where the freshwater grayling, known in French as ombre des rivieres, occurs in a natural habitat. Rumsey 3353.037. Pedley, Mary Sponberg Belle et Utile: The Work of the Robert de Vaugondy Family of Mapmakers, 139.